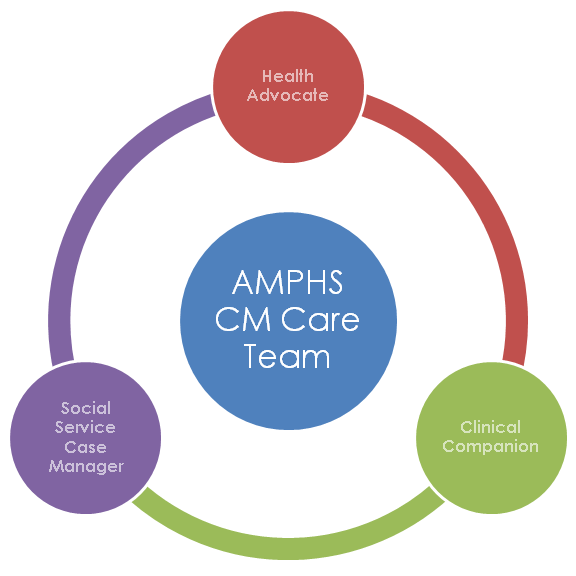 AMPHS programs fall into three key focus areas: Clinical Services, Social Services, and Training & Education. We believe that by developing coordinated and integrated interventions in these three areas, we are able to address the root causes contributing to the health disparities and poor outcomes facing our immigrant populations today. All of our services are delivered in a culturally sensitive and linguistically competent manner, ensuring our community members feel right at home when they visit an AMPHS program site. Our facility serves as a safe haven for our community to engage in a broader dialogue about their overall health and wellness. We do not use the term "patient" at AMPHS. We inherently believe that each "patient" is a person and we see them as our colleagues and peers. That's why those we serve are referred to as our Community Members ("CM"). When we serve a Community Member, we form a unique support infrastructure around each individual CM, what we call the CM Care Team. From the moment you arrive at AMPHS, you will be greeted by a Health Advocate in the language you are most comfortable with. Your Health Advocate will introduce you to AMPHS, what to expect during your visit, and how to prepare for your appointment. He/she will also serve as your language interpreter if would like, and will accompany you throughout your visit. You will then meet your Clinical Companion. He/she is not only a trained and authorized independent partnering clinician from the community, but will take the time to help you figure out the concerns affecting your overall health much like a friend would. To help you get on track with your treatment plan, the third member of your Care Team, your Social Service Case Manager, will work with your Clinical Companion and Health Advocate to figure out the best and most realistic method of ongoing care. Do you need your blood pressure taken or your cholesterol checked? Has it been years or decades since your last visit with a healthcare professional? Do you need to speak to a clinician to address pressing health concerns? Our team and our partners are trained to connect with you on a more personal level and offer a sense of comfort and sensitivity that you deserve. Clinical Services are all free of charge to anyone and everyone, just make an appointment with us! Do you need to figure out how to seek health coverage and social support, including welfare benefits, housing, family planning, transportation assistance or general counseling? Our team provides a wide range of support to address social and environmental determinants of health, including determining eligibility for health coverage; connecting you with free care options; assisting with understanding Medicare, Medicaid, and NYS Emergency Medicaid; and even offering eligible immigrants free prescription lenses to improve vision. Social Services are all free of charge to anyone and everyone, just make an appointment with us! Are you a healthcare professional who needs to obtain certification in cardiovascular life support? Are you a student who would like to take clinical-level trainings to prepare for healthcare professions school, obtain a series of provider-level certifications, and gain valuable experience in clinical practice and public health? Or maybe you are a community member who would like to increase your knowledge of health concerns for you and your family following your clinical and social service visits with us. Our Training & Education programs have the two-fold objective of (1) promoting health literacy and increasing health activation for our community members, and (2) develop core skill sets for health professionals to understand clinical practice within a broader public health setting. We have a series of healthcare professional and community workshops, trainings, and courses to ensure you are fully prepared to respond in any situation and bring your skill set to the next level. Please feel free to browse our calendar of upcoming programs and events. Click on the event listing for any associated details of the event. You can also reformat the calendar to view by Week, Month, or the default Agenda listing. You can also print out the calendar for your records. For any questions, please email: info@amphsonline.org.